This article is the third installment of my examination of reports going to Toronto Executive Committee and to the Metrolinx Board on June 28, 2016. For a complete list, see Part I of this series. This article deals with two separate reports from the City of Toronto and from Metrolinx about Fare Integration. These two reports have quite different outlooks. For Metrolinx, there is an acknowledgement that any new fare policy will be difficult, but a determination to stay the course with their work plan and fare models. 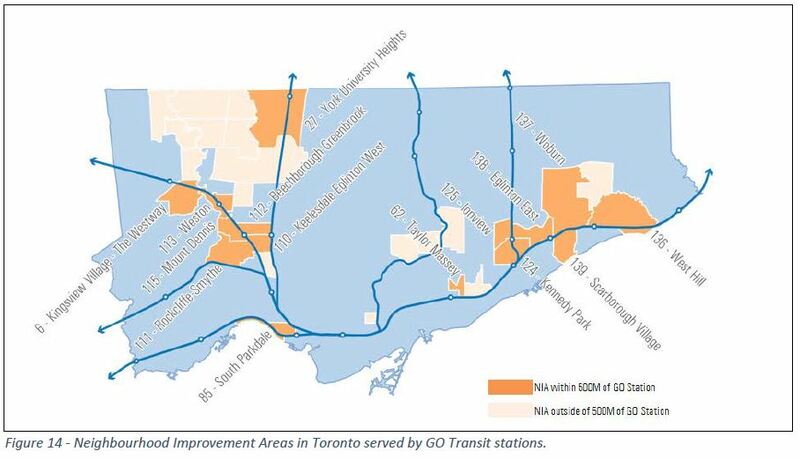 For Toronto, the focus is on the inequity of short versus medium and long-distance GO fares (a problem not just for Toronto as a node), and on the changes needed for GO to become more than a 905-to-Union Station commuter railway. Additional material comes from the Metrolinx Fare Integration Advocacy Groups & Academics’ Workshop held on June 24, 2016. Presentations from this workshop are not yet online. When the work on Fare Integration began at Metrolinx, the framework for the study was revenue neutrality – that somehow all of the existing fare revenue could simply be reallocated by shifting charges around (and possibly acquiring net new revenue from riders attracted by the new tariff). This simply was not possible if the idea was to reduce or eliminate “double fares” without a substantial effect on other riders. In parallel, there are the concepts of “fairness” and “social equity”. One addresses the perception that some riders travel at much less than the “fair” price they should pay, while the other speaks to the premise that some riders should travel at a lower fare to relieve their low income status. Finally, there is the issue of the “value” of transit service, and the components that might justify different fares for what would otherwise be the same trip between “A” and “B”. The philosophical conflicts between these and other goals have never been addressed, but instead the shopping list above is available to justify (or refute) any proposal without being consistently applied, or applied on a comparative basis. 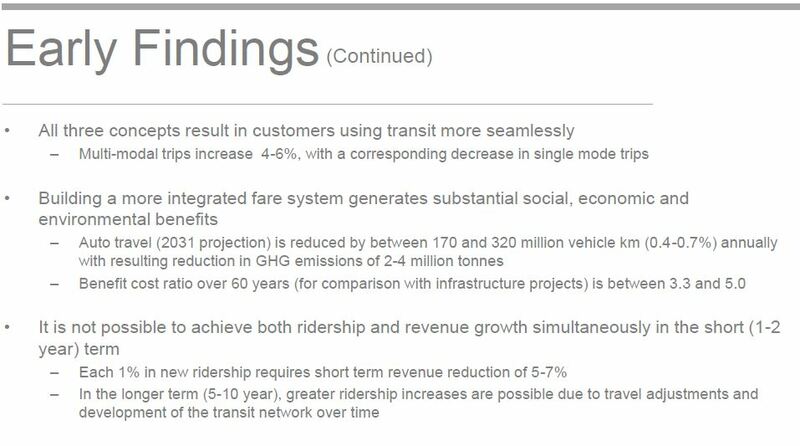 Behind the entire discussion has always been the inequity of the “double fare”, and this is summarized by a Metrolinx slide. “Choosing cheaper and slower trips on the TTC” also brings political pressure for the extension of TTC rapid transit service into the 905. The debate has been as much about bringing the reach of “TTC fares” closer to the commuter market as it has been the stimulus of development in the 905. This skews priorities for capital spending toward subway construction in place of service improvements on the commuter rail network. Indeed, one could argue that SmartTrack is an example, flawed though it might be, of the perception that GO is too expensive to play a meaningful role beyond its current function. A subtle distinction in the “boundary effect” with existing fares is the presence of absence of the Presto fare card. Unified payment technology is a separate issue, but a major annoyance for riders, from the question of unified fares. The former problem will vanish by the end of 2016 as the TTC completes its Presto migration and the remaining issue will be the perceived fairness of cross-border fares. Collectively, Metrolinx claims that there are about 4 million daily trips implying that the cross-border moves represent about 20% of the total. These numbers should make readers pause for a moment because the TTC carries less than 2 million a day, and the rest of the GTHA comes nowhere near this level (GO Transit is 1/10 the volume). The first question is whether these are “linked” or “unlinked” trips, although if they are unlinked, then the border crossing disappears because it exists at the boundary between links (e.g. GO train to TTC subway). Alternately, is this a projection for a future date when ridership has doubled compared to today? The breakdown above illustrates an important point: a minority of the cross-border trips are going to downtown, roughly 1/8 of the total, and half of them are bound for locations outside of Toronto itself either from within the City, or from one transit system to another. Moreover, GO Transit trips are overwhelmingly bound to or from Union Station (94%), and so there is a much larger volume of travel crossing fare boundaries than GO Transit itself represents. Even more astounding, the modelling predicts that removing the fare barrier (the exact details are not published) would increase trips by only 22,000, or roughly half a percent of the total. The expected shift of auto to transit trips is in the range of 0.4% to 0.7%, a value so small as to be within the margin of error of any estimate. If the intention is to encourage more travel with fewer boundary-induced penalties, this is a hopeless outcome. There is absolutely no point in throwing the entire region’s fare structure up in the air for such a small benefit to riding or to reduced auto travel. My gut feeling is that the numbers are wrong, but the material presented at the workshop only included summary figures without the underlying data. 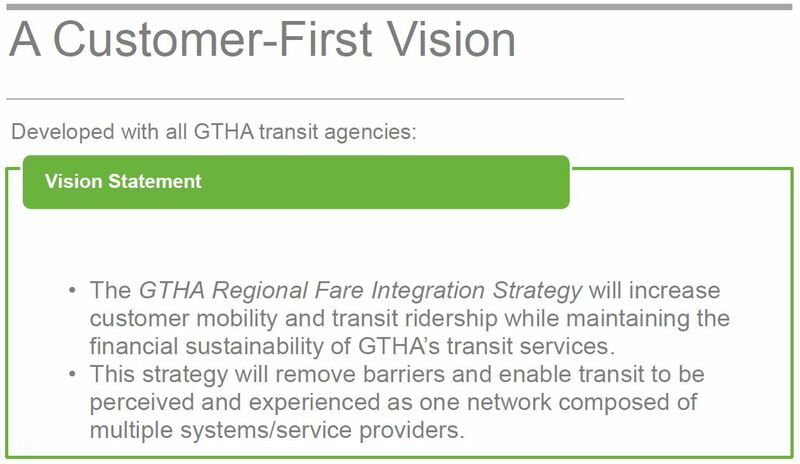 The second bullet in the Vision is the experience of regional transit as one network despite multiple providers. This will never be possible if there are wildly different levels of service quality (frequency, hours, transfer co-ordination). Even within Toronto there is a huge difference between the standard applied to rapid transit service (frequent service regardless of demand) and that used for surface routes (frequency based on actual demand), and the disparity is even greater when the 905 systems are included. An integrated fare, whatever that means, will not change this. A major source of increased travel demand by any mode is the suburb-to-suburb commute. This market has a very complex origin-destination pattern, and it does not lend itself to the simple solution of building one rapid transit line that will magically solve all problems. “Rapid transit” will continue to be distant from most suburban travellers, and the degree to which transit’s presence must expand simply to be a credible option for this market is enormous. Low levels of transit use today do not bring strong voter support for big increases in transit spending. A related problem is whether suburban networks should focus on local travel which is today overwhelmingly by car as there is no alternative, or on providing “last mile” services for the regional commuter system. These have very different travel patterns, and the choice to serve one may come at the expense of the other. This is not just a 905 issue, and we see within Toronto a surface network where a significant function in the outer 416 is to deliver riders to the subway, not necessarily to other non-subway destinations. The two goals continue a tug-of-war for attention and funding within Toronto transit planning. 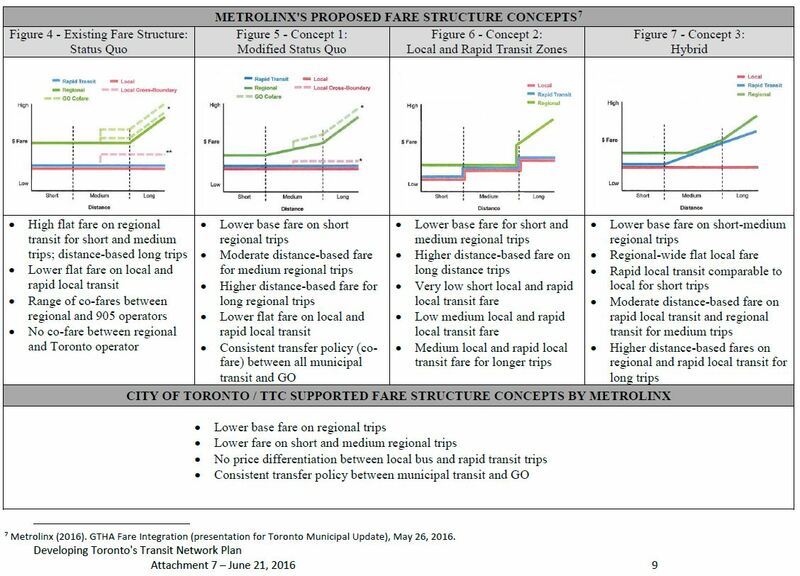 Metrolinx has proposed three concepts for a new fare structure pretty much since the beginning of the debate. Many different price models have been run by Metrolinx to see their effect, but none has been published. Although numbers showing effects appear in public reports, the underlying assumptions and the comparative effect of changing the fare model are unknown. An informed debate is impossible without this. The City report contains a superior presentation of the fare schemes by placing them on one page where they are easily compared. The substantial changes in short-distance GO fares are obvious, but also the effect on local fares in the various schemes. Of particular importance is the fact that a large proportion of “local” trips within Toronto include some degree of subway travel, and so the number of riders who could face a higher fare (possibly, but not necessarily offset by a lower fare for short surface-only trips) is substantial. A notable change in the definition of “rapid transit” compared to earlier versions is that “LRTs” are now included as higher-priced services. Originally this included only the Toronto subway because, according to Metrolinx, the model data are based on 2011 travel patterns and there was no LRT or BRT travel in that network. For an agency supposedly planning for 2031 and beyond, that is an astounding admission. Moreover, there is no reason why BRT lines should not receive the same treatment. It is ironic that in the process of trying to “integrate” fares, Metrolinx proposes to balkanize the local transit systems. This brings the obvious point of separate pricing based on a class of service, and just what defines the transition between classes. There is now a premium fare on some TTC express buses to downtown, but the York University Express runs on a transit only road at regular TTC fares. BRT roads in the 905 provide faster service for some routes, although they are rarely “end to end” operating on reserved lanes. Should a higher fare be paid for these services? Should the Spadina streetcar be a premium fare “LRT” even though it is one of the slowest routes in the system, a function of high demand, closely-spaced stops and many traffic signals? Should the Hurontario LRT be a premium fare service while routes on the Mississauga busway or Viva in York Region operate at standard fares? What is really going on here is that Metrolinx is defending the higher fare for GO Transit by attempting to merge the “premium” subway service (and now LRT) into that fare class, even though GO provides demonstrably different service because of its very widely spaced stations. (We will ignore the “express subway” in Scarborough for the purpose of this discussion.) Riders on the Yonge subway at peak periods might disagree that theirs is a “premium” service as the alternative, the Yonge streetcar, is only a distant memory for most of them. Modification of the existing system is self-evidently the easiest to implement because it requires comparatively small changes to the structure (same basic ideas with possible adjustment of individual components such as co-fares or the GO tariff). This structure may have the least increase in TTC/905 transfers, but this is not quantified as to scale relative to the other concepts. Are we talking about a major uplift in cross-border travel, or relative differences among the small values? Both concepts 2 and 3 speak of a reduction in longer distance subway trips, but do not address where these trips have gone. Did they migrate to buses, to GO, to autos? The question of change in travel mode induced by the fare structure shows up in various ways. 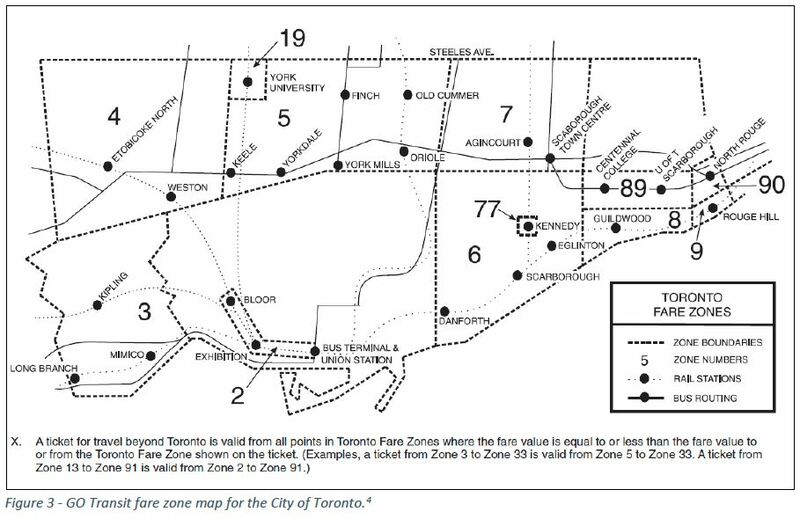 Zone fares make life much more complex for local trips (which cover a huge territory when one considers the size of Toronto). A modified GO fare (part of concept 1) leads to the greatest growth on GO, but can GO actually absorb the demand? There is a disconnect between past claims that “GO is full” and the idea that the commuter rail network can take on a significant new role for shorter trips. In the workshop, there was even a passing reference to forcing demand balancing through fare policy. This would be a contrary to the stated goals except for the idea of distributing demand “efficiently through the network”, a concept that opens a Pandora’s box of whether capital or operating “efficiencies” should trump passenger convenience and the attractiveness of service. The claimed benefit-cost ratio of 3.3 to 5.0 is simply not credible without knowing the basis of calculation. What costs are incurred? Are new operating subsidies implied? Where is the cost of additional service to improve the 905 bus networks and address both local travel demand and the “last mile problem” for GO? Metrolinx is in love with benefit-cost ratios, but their calculations are often dubious, and the use of a very long timescale (60 years) has the earmarks of an attempt to include as much future revenue as possible. Achieving increased ridership through fare changes is incredibly expensive. The 1% new ridership shown above would cost $130-180m depending on the assumed fare structure. How this can possibly have a positive benefit-cost ratio is a mystery. The last bullet is understated and roundabout, yet vital – greater ridership increases would come from development of the transit network. In other words, the fare system alone is insufficient to bring growth. Any tactic that rebalances fares involves more subsidy and revenue reallocation to existing riders than it does to attracting new ones. Service is key. The shift of riders from GO to local transit to trips to the downtown core must not be ignored, and on two counts. First, there is no capacity to absorb such an increase, and the cost of providing new capacity (capital and operating) must be weighed against the benefit to the affected riders. Second, it is clear that the demand model “believes” that riders are price-sensitive, and this has implications for the effect of fare increases some options would impose on local trips. The justifications for fare-by-distance reveal a strange view of how the network would behave. First, it would give “greater customer choice” between rail services including LRT. That presumes, of course, that such a choice actually exists. For example, the Crosstown LRT is planned not as a net new service, but as a replacement for a large number of bus routes just as the Bloor and Yonge subways replaced very intensively used streetcar routes in their time. Riders will be forced to pay more for the new service because they have no option. Moreover, the absence of BRT belies a Metrolinx focus on inside-416 “rapid transit” as a cash cow and their long-standing view that the Crosstown should be viewed and operated as a “regional” service. A discussion of outside-416 “rapid transit” fares is long overdue, including a definition of just what that term means. The idea that FBD would be used to offset “revenue decreases from fare reductions elsewhere” shows what is really going on here. The only way to make the scheme revenue neutral and avoid the need for higher subsidy is to charge some riders more so that others can pay less. That is not what “fare integration” is supposed to be about. After all of the machinations about possible fare structures, Metrolinx comes to the conclusion that they can achieve “significant benefits” by modifying the existing system. As with so much else in this study, what is missing here is a quantification of relative benefits and costs, not to mention the numbers of riders affected and the scale of the effects on their travel budgets. Throughout this entire discussion, Metrolinx has failed to consider the role of time-based fares, that is to say, the treatment of a “transfer” as a time-limited pass rather than the more restrictive use it has today for single trips and limited cross-system travel. Indeed, when this has been raised in the past, “time-based fares” were misrepresented as charging by trip minutes, and “transfer rules” were considered as local decisions beyond the study’s scope. The move to a “two hour transfer”, a form already used in much of the GTHA, eliminates much complexity in automated fare collection, and enables “trip chaining” where multiple short hops are not discouraged through the requirement for a full fare at every stopover. This addresses a major social equity issue for riders whose travel patterns are much more local, with multiple stops, than the typical commuter pattern. Also missing here is a substantive discussion about costs and “fairness” of the fare system. Many debates have turned on the perception that “somebody else” isn’t paying enough, and that transit nirvana could be attained simply by charging “them” more. Conversely, some fare options sit for years as proposals because nobody wants to pony up the added subsidy they might require, and the perception that yet another group of “not I” is getting a break on fares at the general expense. This is a ludicrous situation when we see daily press conferences where Ministers and Mayors never tire of reminding us of the billions in spending on new capital projects. The TTC estimates that a two-hour transfer would cost a bit over $20 million in foregone revenue. I refuse to use the term “lost revenue” because for that price, we are gaining something in return – a transit system that does not penalize short-hop trip patterns. It is an investment, not a cost, and should be evaluated just as any other proposal on that basis. Future work will concentrate on the “modify” option “for deeper evaluation, considering short-, medium-and longer-term opportunities” [p 19]. We have travelled a very long distance to reach the point of acknowledging that turning the fare system upside down might not be the ideal approach. The City’s report on Fare Integration takes quite a different tack from that by Metrolinx. The City is looking both at how fares could be used to increase the role of GO within the 416, but also at the ways in which the Metrolinx schemes actually work contrary to provincial policy. The situation is complicated by the need to maintain the fiction that “SmartTrack” will actually exist as a separate service rather than simply applying a new fare structure to all GO operations within Toronto, including to the corridors that were not part of the Mayor’s election platform. The focus is overwhelmingly on GO+TTC fares, as opposed to TTC+905 fares for local services. 1. GO Transit fares are structured to benefit long-distance commuters, which encourages urban sprawl and is thus at odds with City goals and objectives and provincial growth management policies. 2. 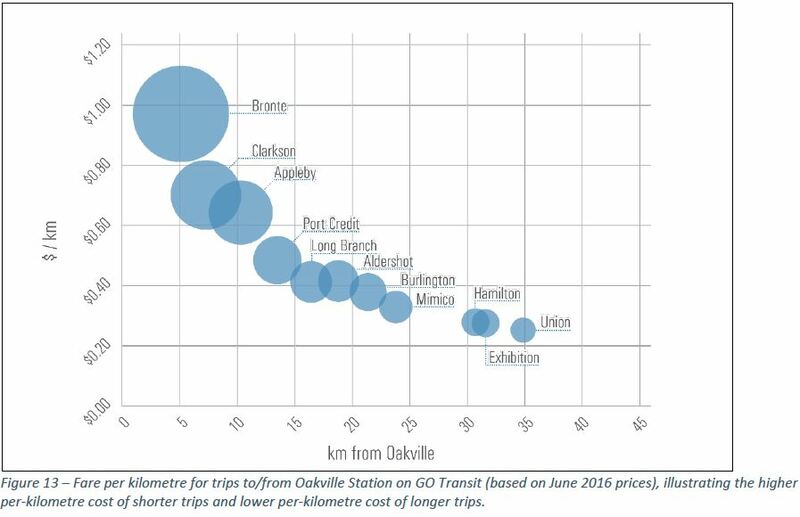 GO Transit fares are relatively high for short trips (on a per-kilometre basis), which discourages transit riders in Toronto who tend to make shorter trips on average due to closer proximity to Union Station; the major destination point for trips on GO Transit. 3. 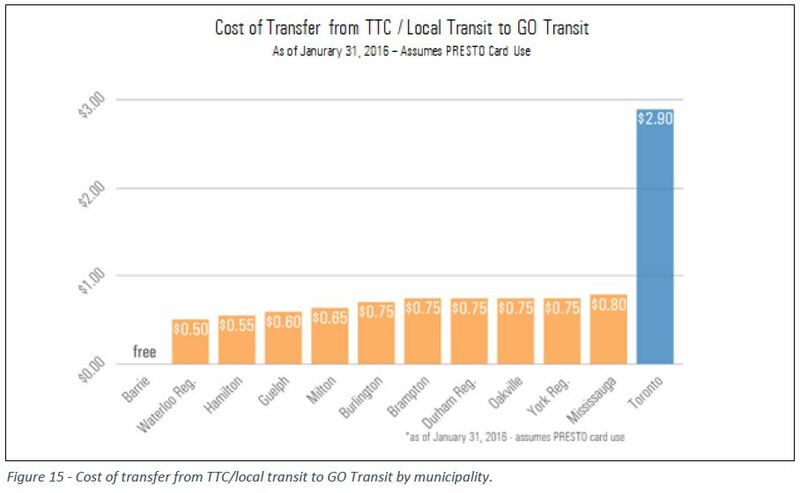 GO Transit fares are not affordable to low-income residents (a large number of whom live in neighborhoods where GO Transit is the only rapid transit option) due to the high cost of short trips within city limits. 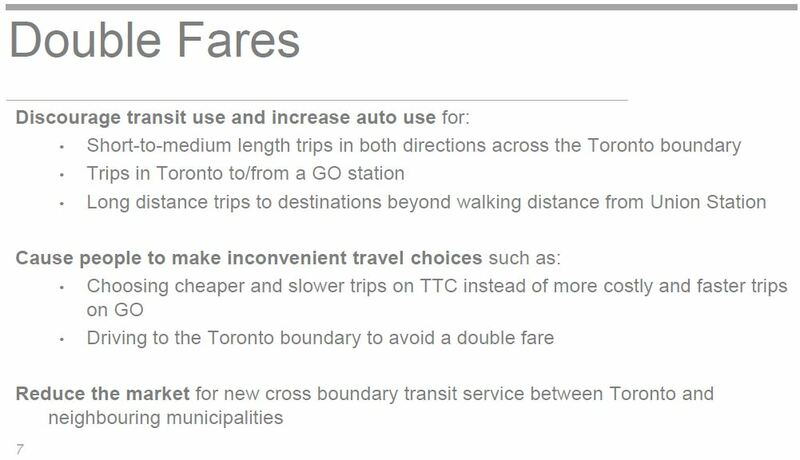 The City seeks to have GO make two changes: reduce the fixed component of their fares so that distance is the greater determinant for short trips, and provide a TTC-GO co-fare to reduce or eliminate the barrier to travel on GO (and by extension SmartTrack) within the City. The report is guardedly optimistic that Metrolinx is headed in a compatible direction. 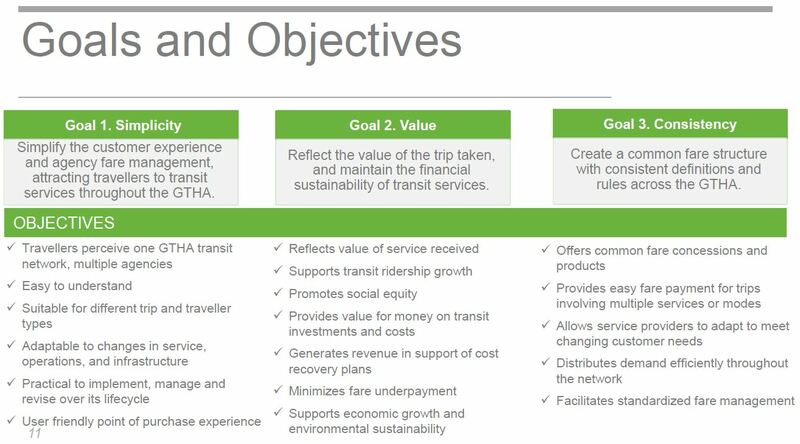 Some elements of the fare structure concepts being considered by Metrolinx in the GTHA Fare Integration review appear to conceptually address some of these considerations. Staff support the general direction that appears to show a reduction in the base fare for regional transit in each concept, and consistently applying the co-fare as shown in the modified ‘status quo’ concept. The actual fare levels for the base and distance components and co-fares have not yet been addressed. A separate report will come to Council from the City Manager on SmartTrack fares at a later date. Unlike Metrolinx, the City actually analyzes GO fares to expose their built-in inequity. The inflection in the curve occurs roughly at the transition from the 905 into Toronto where GO has traditionally charged more, at least in part because they claimed that Toronto riders would flood their services if fares were cheaper. This problem does not only affect travel to Union, but to other potential nodes on the network. 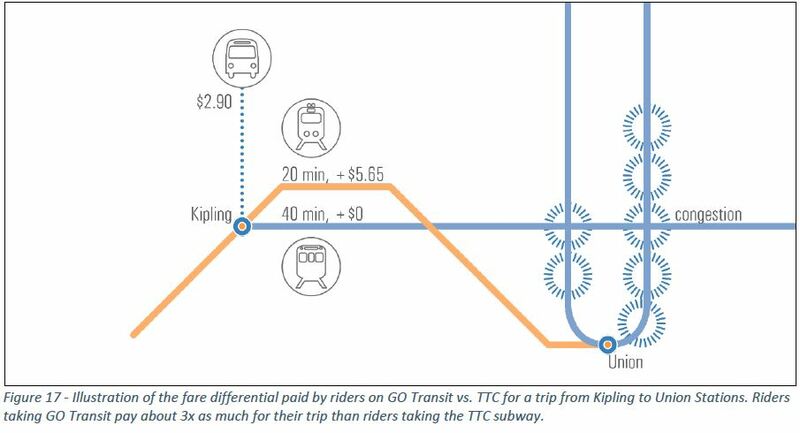 For Kipling Station, the cost of accessing the subway by GO is very high just for the GO component of the journey, never mind the additional TTC fare. It is little surprise that a subway extension is among the options often heard from those living to the west of Kipling. At Oakville, the same situation applies. It is much cheaper (by distance) to travel from Union or from Hamilton than it is from stations nearby. Metrolinx may talk a good line about nodal development other than downtown, but their fare structure does not support this. Although GO is nominally distance based, the fare zones have a gerrymandered quality showing what has been necessary to superimpose higher “in town” fares on what should be a distance-based zone system. The City generously observes that Metrolinx is trying to fix things. Both the Base and Rate values would go up by the same percentage each year unless there were a long term plan to rebalance these gradually instead of all at once. The Metrolinx tiered approach does not, and never has followed that pattern. Lest Metrolinx present everything as sweet agreement among all parties, the City is more circumspect. The City raises problems with the Union-centric nature of the Metrolinx presentation, as well as with the high level of integration at the service and operational level between modes on the TTC. To save on scrolling, here is the chart of Metrolinx proposals again. 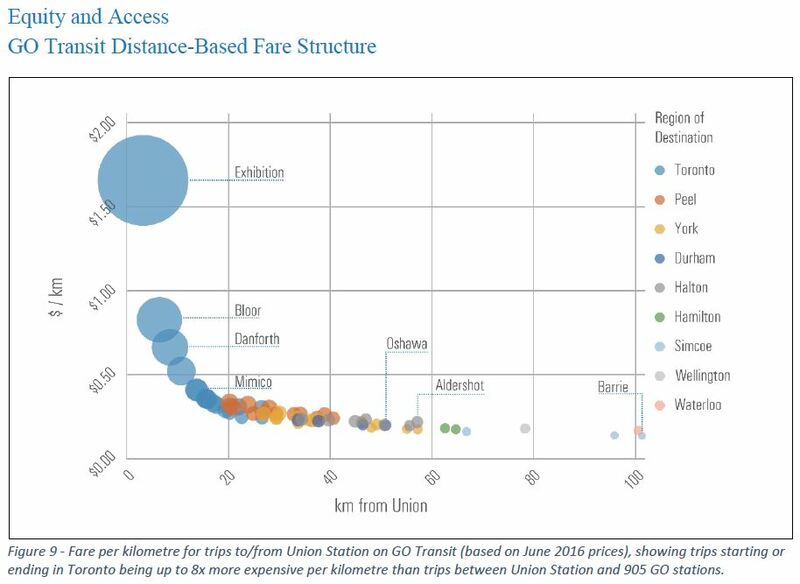 In Figure 4, Metrolinx has characterized the current ‘status quo’ fare structure. This diagram reflects the fare structure from the perspective of Union Station. 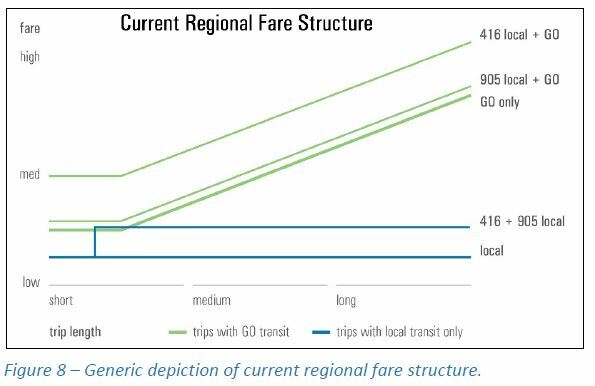 A more generic characterization of the fare structure is diagrammed in Figure 8, reflecting fares for transit trips that could start and end anywhere in the region, and accurately shows GO Transit’s distance-based fares applying to short and medium length trips. If the base GO fare were lowered, and the distance component increased, this would make short trips cheaper, but long trips more expensive, a result that might not be attractive in the outlying portions of GO’s network (Hamilton, Kitchener-Waterloo, Barrie). This brings up the basic question of whether GO exists primarily to recover its costs, or to encourage a shift from auto to transit riding. Are higher per kilometer subsidies to very long trips justified by the reduction of auto travel? In any event, those long-haul subsidies should not come at the expense of short-haul riders. The City notes that the GO fare structure is out of step with many existing policies and goals. The fare structure is not integrated with local systems (especially in Toronto where no co-fares is available), and fare levels are inconsistent with those charged by local agencies. The high base fare discourages shorter trips and compact development, and the low distance-based component encourages longer trips and urban sprawl. Equity issues are discussed far more extensively by the City than by Metrolinx. There remains a basic question of “what do we mean by ‘equity'”, but at least the City is engaged with this. Today, discounts go to various groups regardless of their ability to pay such as seniors and students. Indeed, there is no mechanism in the current fare system to differentiate on any basis other than a widely recognized and documented one (seniors’ cards, student cards, apparent age of children, etc). For transit fares this is a particular problem because subsidies are provided individually when the fare is paid, not (like shelter costs) on a group basis to a family and its dependents. This can be addressed through smart cards like Presto registered as part of a benefits group, but this is not as simple as a supply of subway tokens provided below cost for sharing as needed. The City has 31 Neighbourhood Improvement Areas of which only 5 are served by the subway system, but more by the GO network. This alignment is not surprising because rail corridors tend to serve old industrial districts where housing would be cheaper, and the social environment less supportive than in less industrialized residential areas. The NIAs represent 12% of the City’s population. However, the high cost of short-distance GO fares makes this network essentially vanish from the travel options available to low-income riders. Co-fares figure into this too because even if GO’s own fares were lower, there would still be the disincentive of paying a full TTC fare just to reach a GO station. The rationale, of course, is that GO (and by extension Queen’s Park) prefer to subsidize the 905 and leave Toronto to its own devices. This might work in an era where the province had little role in Toronto’s transit beyond handing over money now and then for new ribbon-cutting opportunities. However, with the increased presence both through the takeover of LRT network construction and with the recognition that GO could do more for local travel, this isolation doesn’t work. As with any fare structure, the underlying policy choices can lead to distortions such as the relative cost of including GO travel in one’s journey. 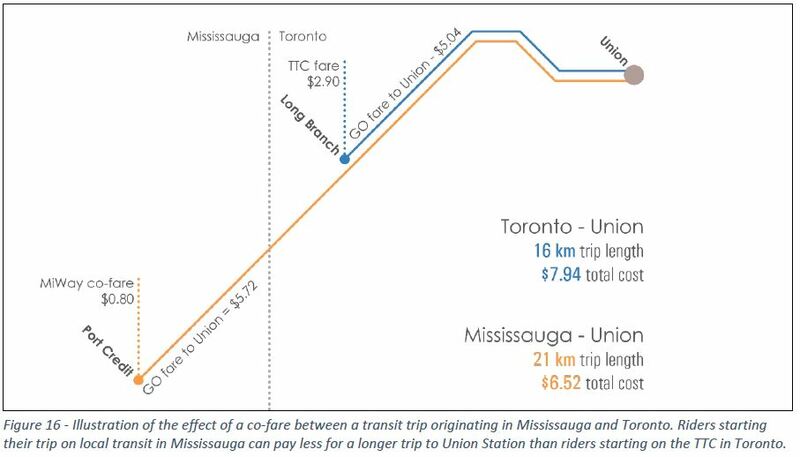 In the example below, one who journeyed from somewhere in southern Etobicoke to Union via TTC plus GO (to avoid the interminable ride on the streetcar network over that distance) would pay more than someone coming from Port Credit Station, which is only one beyond Long Branch. This is an example of a provincial policy that hurts Toronto riders, but it gets far less attention than the griping we might hear from the lack of 905-416 co-fares at Kipling Station. It is no surprise that the number of Toronto residents making the TTC-to-GO transfer daily is under 10,000 while in the 905, there are far more local transit-to-GO transfers, 38,000. Even the attempt to provide an “integrated” fare at Danforth and Exhibition Stations has produced very little uptake because riders face the cost of a Metropass plus a $60 premium to ride on GO for their hop to Union Station. 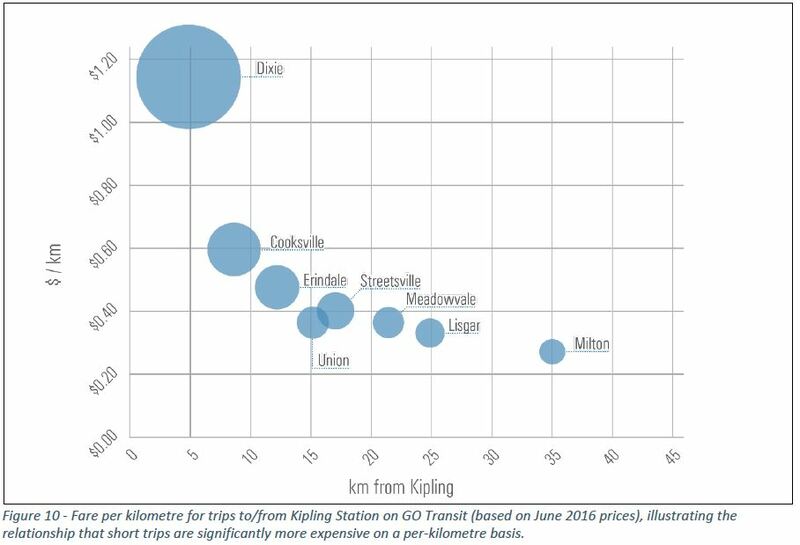 A fascinating view of co-fares revealed by the City report (but not, as far as I know, in any public Metrolinx report) is that co-fares are not a significant reason why riders choose GO. Metrolinx has recently undertaken a review of the co-fare program. The original purpose of the co-fare was to replace GO Transit’s discontinued community shuttles, which connected people living in 905 residential communities without good local transit to nearby GO stations during the system’s earlier years of operation. A secondary benefit is relieving the need to construct and maintain expensive and land-consumptive parking spaces at GO stations. 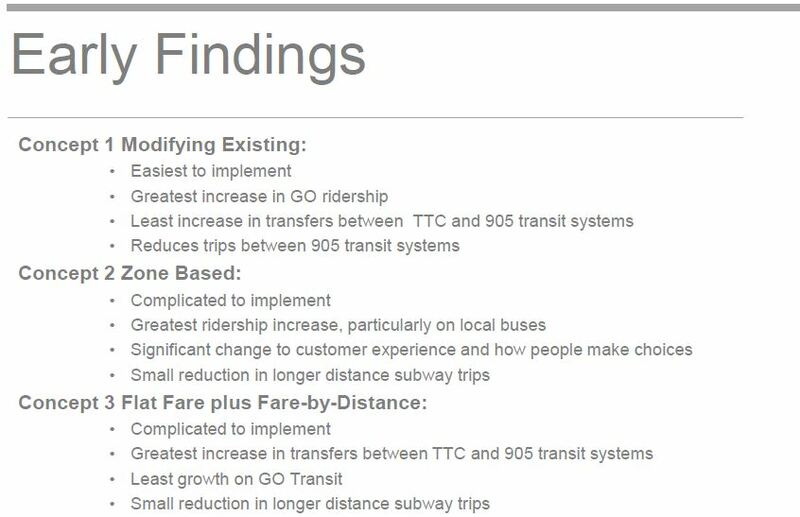 The review found that co-fares did not contribute significantly to ridership on the GO system, as existing co-fare users would either continue paying full local transit fares or drive to GO stations. Metrolinx will consider the future of the co-fare program in conjunction with a new station access policy. The City goes on to observe that the $13 million Metrolinx now spends on co-fares for the 905 might provide greater value-for-money in Toronto where the ability to feed the GO network through the TTC is higher than in the 905. I cannot help seeing a ghostly “wink” in that statement because it aims straight at the type of financial analysis underlying so much that Metrolinx does. If transit cannot get “value-for-money”, then we don’t do it, no matter what. The basic point, as I stated earlier about long-trip subsidies, is that GO exists also as an instrument of policy to get people out of their cars, and to avoid expansion of the expressway network. This has a cost both in GO operations and in the need to subsidize local transit services, one which Ontario has consistently avoided. The skewed fare system is a direct result. This entry was posted in Beyond 416, Fares & Fare Collection, Service Cost and Quality, Transit. Bookmark the permalink. It’s worth pointing out that the Presto implementation on TTC buses isn’t even cross-border. You still need to carry a YRT or MiWay fare if you’re crossing Highway 427 or Steeles Avenue on a TTC bus. Funny how fare integration isn’t very…you know…integrated. Steve: Your link takes me to a generic YRT page. Where is the specific info you wish to cite? Well done Steve. Would be interesting to add in something like the City going to Toll roads or congestion pricing. Thanks very much for this wonderful and detailed critique Steve. One quick point – it’s far too much like a shift and shaft exercise vs. actually looking at transport economics ie. how well cars and suburbs tend to be subsidized, and rather than going through the exercise of how do we get further $crewed in the core, we should look at how suburbs and automobility are given subsidies. vtpi.org is one resource; Pamela Blais’ Perverse Cities is another reference. Sadly, as the old core is outvoted by the more suburban areas (eg. core is against SSE, and the suburbs are supporting it), the outer suburbs tend to now hold many cards as the cities are still creatures of the province and despite their mammoth deficit, the provincial Liberals are in all likelihood keen on re-election, which likely means further avoidance of user-pay for the cars etc. How many get off GO (or UPX) at Union to continue their trip on the TTC? I can see people using the TTC in Scarborough to get to a GO Station, ride the GO train to Union, and transferring to Line 1 (using the transfer from somewhere in Scarborough) to continue in the opposite direction of most of the others on the subway. The current situation is that there is no discount for doing so. There should be. The YRT home page has a blue box (News) on the right side. The item ‘Presto rollout on TTC” describes the situation quite well. The problem appears to be that Presto has no way to assign the fare to two different transit agencies based where the bus is currently running (i.e. TTS when within Toronto and YRT when north of Toronto). TTC is continuing to install PRESTO card readers on their buses. As a result, customers may begin to see PRESTO devices on TTC routes operating in York Region. However, the PRESTO system does not yet provide a way to pay both TTC and YRT/Viva fare using a PRESTO card. Until a technical solution is implemented, customers will not be able to use their PRESTO cards outside of Toronto, on a TTC route entering York Region. Instead, customers are advised to continue paying both TTC and YRT/Viva fare using tokens, paper tickets or passes. TTC is working with PRESTO to determine the best solution for customers who travel between Toronto and York Region/Mississauga. More information will be shared when it is available. It says a lot about how well Presto is prepared to support the TTC changeover that they missed this issue in their software updates. I was on a TTC Bloor night bus recently and overheard a conversation about Presto between a rider and the operator. The operator remarked that he’d yet to receive a Presto-equipped bus, even though the rider said he usually caught one on that route each night. The operator said he had been given zero training about how Presto works, didn’t even know the placement or appearance of the readers, and was completely unprepared to handle fare payment scenarios or answer any questions. All he could do was laugh because the rider knew far more than he did. I don’t dare move to Presto until I’m forced off the MDP, seeing how poorly handled this implementation has been. On a related note, I routinely pass through Bay subway station and have witnessed the introduction of the new fare gates. Most of them don’t accept Metropass, only Presto, and as such go mostly unused. This is actually a good thing because the gates keep failing. I pass through there at least two days a week and have seen technicians there nearly every time with one or more of the gates in pieces. They’ve gotten in the habit of leaving one of the wider gates open and having an attendant wave through everyone with a MP or transfer, while everyone exiting tends to head out through the same gate because they don’t yet understand the exit procedure. A few times so many of the gates were out of service they had no choice but to have everyone enter and exit through a single gate. These are supposed to be a production-grade product?!? It’s nice to see the TTC finally moving into the future, but it often feels like the future is a brick wall and the TTC is a bus driving full-speed towards it. Steve: But all the reports will tell us everything is smooth sailing because transit news these days is all about big smiles and a hope that nobody looks too closely at what is really going on. I’m wondering if that distance in the report was done to justify within Metrolinx what they had been told by their political masters. Fare by distance or fare by mode is not thought well of in the inner suburbs.